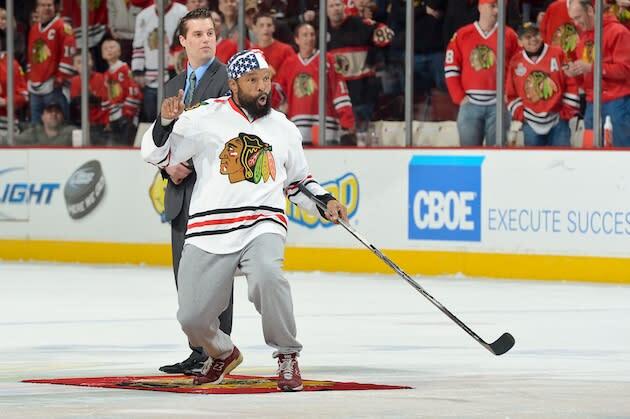 A day after Jim Belushi awkwardly held court at center ice during the "Shoot the Puck" intermission game, the Chicago Blackhawks invited a true American hero to try tonight between the second and third periods of their tilt against the Calgary Flames. When Belushi fails to deliver, you bring in a better 1980s entertainment icon. So the Blackhawks went out and got Mr. T, a man who known for getting things done. It wasn't his first time doing this, but the man once known as Clubber Lang still had a familiar prediction: Pain! As Mr. T referenced in his pre-shot interview, he participated in "Shoot the Puck" back in 2011, and that practice helped him make his shot tonight. And if you're wondering, no, those weren't Jersey Fouls either time. It's Mr. T after all. He'll always get a pass.